One of these is the submersible aerator TRN in the current version: it pumps self-priming ambient air into the wastewater tank to support sewage treatment. The movement that is created protects against deposits. The system competes with the common membrane aerator: In comparison, the TRN stands free in a tank without the need for building work, does not need a compressor and manages without air voids, which can naturally become blocked up. The TRNs can be serviced individually, so that the sewage treatment process does not need to be interrupted. They are also used as a backup or extension for peak loads. They are viewed as a productive solution for small to medium-sized systems. The LSC is also shown in action: a small flat suction pump, which removes water from flat areas to a residual height as little as 1mm in continuous operation without supervision. It's easy to remember: The LSC weighs only 11 kg, pumps up to a height of 11 m and conveys up to 11 m³/h. A special valve stops the return flow of water even in snore mode. It is standard equipment for many fire brigade services. 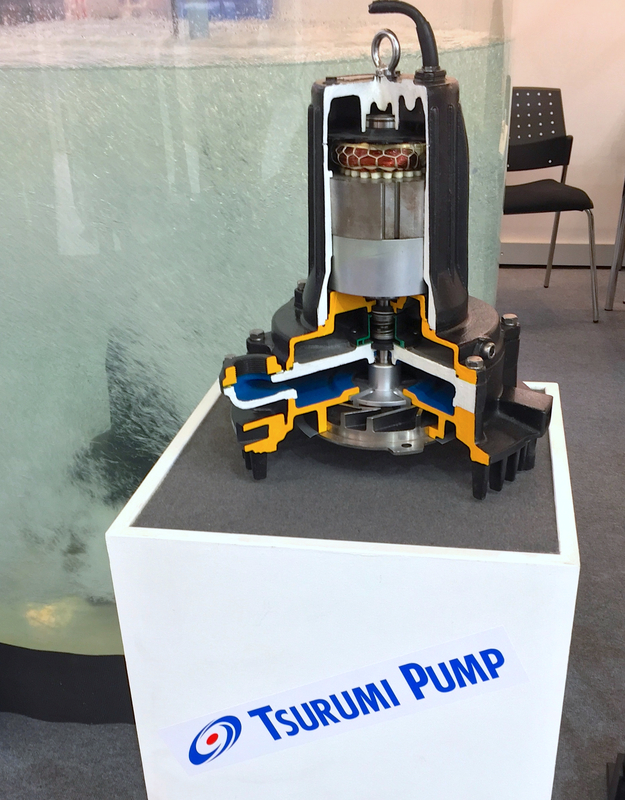 It can be even more compact: With around 3400 grams, the new family member is surely the smallest pump of its type at the IFAT. It can even hide behind an iPad. Its performance is impressive: This powerful midget manages up to 5 m³/h and 6 m head. This innovation is designed as an ever-ready pump for tradesmen and all types of businesses. Many more solutions are exhibited for the "big" professionals, with universal and specialist pumps for light to heavy media amongst them. Tsurumi, with its European headquarters in Düsseldorf, Germany, is renowned as one of the leading global manufacturers in the industry. More information at Tsurumi.eu on the Internet.